Fair Saint Louis visitors, workers and volunteers can avoid traffic congestion, street closures and parking issues by taking Metro Transit to the annual celebration. Extra MetroLink trains will be running to accommodate the large crowds on Wednesday, July 4, Friday, July 6, and Saturday, July 7. Fairgoers can take Metro in and out of St. Louis for the daytime fair activities as well as for the nightly entertainment and fireworks shows. Cardinals fans going to the evening games Wednesday and Friday, as well as the afternoon game on Saturday, should also consider taking MetroLink to avoid traffic and parking issues. With triple digit temperatures in the forecast, fairgoers can also seek relief from the heat on one of two MetroBus vehicles being used as cooling centers at the fair. On July 4, Metro will run on a Sunday schedule in observance of the holiday. However, extra MetroLink trains will be in service starting at 6 p.m.
Wednesday, July 4: MetroLink will operate on a Sunday schedule with additional trains in service from 6 p.m. to 11:30 p.m.
Friday, July 6: MetroLink will operate on the weekday schedule with the 12-minute afternoon rush hour service extended until 11:30 p.m.
Saturday, July 7: MetroLink will operate on the normal Saturday schedule with additional trains in service from 6 p.m. to 11:30 p.m.
Wednesday, July 4: Take MetroBus routes to downtown St. Louis and Civic Center Transit Center, located just a few blocks from the parade route. 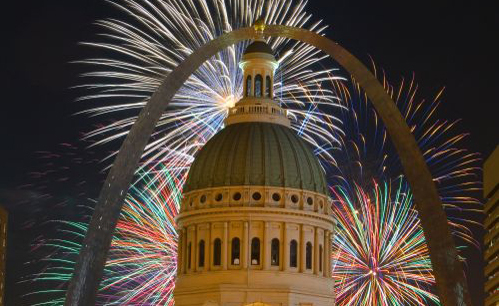 MetroBus will operate on a Sunday schedule and routes serving downtown St. Louis will be rerouted on July 4 starting as early as 6 a.m. until 12:30 p.m. or until the streets are reopened following the Veiled Prophet Parade. MetroBus reroutes for the parade can be found on Metro’s website under Rider Alerts. Customers should look for reroute signs at affected bus stops in downtown. Extra buses will be put into service after the fireworks show, if needed. Friday, July 6: MetroBus will operate regular weekday service. Extra buses will be put into service after the fireworks show, if needed. Saturday, July 7: MetroBus will operate regular Saturday service. Extra buses will be put into service after the fireworks show, if needed. In St. Louis County, fairgoers may park free in the park-ride lots located at the North Hanley, UMSL South, Rock Road, Wellston, Delmar Loop, Richmond Heights, Shrewsbury-Lansdowne I-44, Forest Park-DeBaliviere, and Brentwood I-64 MetroLink Stations. In St. Clair County, fairgoers may park free in park-ride lots located at the East Riverfront, 5 & Missouri, Emerson Park, Washington Park, Fairview Heights, Memorial Hospital, Swansea, Belleville, College, and Shiloh-Scott MetroLink Stations.